Detailed on DirecTV today, the company announced the addition of the DirecTV Genie HD DVR as a competitor to Dish Network’s Hopper DVR system. The DirecTV Genie set-top box offers the consumer the ability to record up to five different shows in high definition at the same time. According to DirecTV management, the Genie should be able to store up to 200 hours of high definition content on the one terabyte drive within the device. 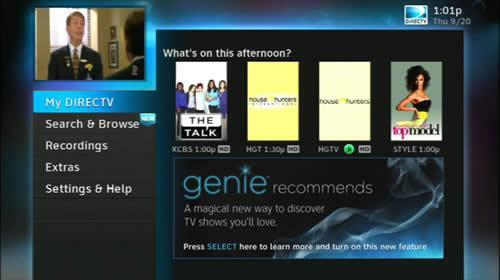 In addition, the Genie can play up to four different live or recorded shows on other televisions within the home. 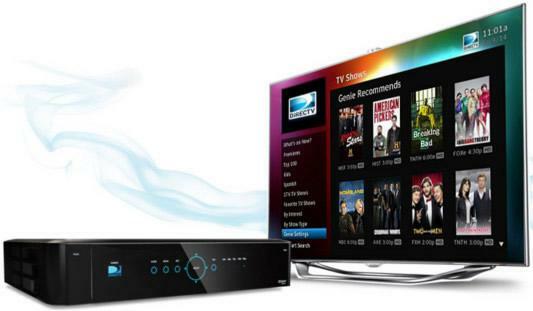 In order to connect to the other televisions in the home, the DirecTV subscriber must have a RVU-enabled television or connect a small receiver called the Genie Mini to the television set. Currently, only a handful of Samsung LED televisions are RVU certified. For those unfamiliar with RVU, it’s a communications protocol that facilitates access to high-definition programming, media and other applications between two devices. Besides DirecTV and Samsung, other members of the RVU alliance include Verizon, Cisco and Broadcom. It’s possible that more television manufacturers will roll out RVU-enabled televisions during CES 2013. In addition to allowing subscribers to record a large amount of content, the Genie also has a recommendations engine similar to a TiVo. Called “Genie Recommends” within the user interface, the software will suggest television shows and movies based on your viewing habits. However, this is an opt-in feature that has to be turned on and will authorize DirecTV to analyze the type of shows that are being watched on the Genie. The user interface allows the subscriber to record shows up to two weeks in advance in addition to catching up on shows that are no more than five weeks old. The Genie also comes with standard applications within the user interface such as Facebook, Twitter, ScoreGuide and Pandora. According to DirecTV’s site, the Genie has a MSRP of $299 and the Genie Mini clients are priced at $99. However, new customers will be able to acquire the Genie and up to three Genie Mini’s for free assuming they sign up for an extended service contract. Two additional Genie Mini clients can be purchased at a discounted price of $49 each. In addition to the new hardware, the subscriber will have to pay an additional $20 monthly fee for “Advanced Receiver Service.” However, that fee can be cut in half by signing up for automatic bill pay. Different from Dish Network’s Hopper system, the DirecTV Genie set-top box does not allow the user to automatically skip past annoying commercials. Identical to other DVR systems, the user has to fast forward to get past the commercials during a typical television show. However, the Hopper has three tuners compared to DirecTV’s Genie. When it comes to tuners, TiVo also lags behind the Genie with the recently released TiVo Premiere 4 DVR. The standard TiVo Premiere 4 utilizes four tuners and can record up to 75 hours of high definition programming. However, the TiVo Premiere XL4 can record up to 300 hours of high definition programming compared to the Genie’s 200 hour limit.